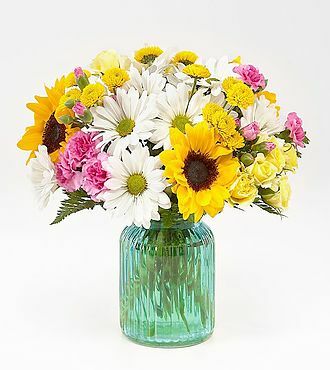 With its sunny hues and fun floral variety, this bouquet will light up the face of whoever you give it to. Through a bright combination of sunflowers, daisy pompons, and spray roses set in a ribbed aqua glass vase, our FTD florists have designed a bouquet that brighten up every moment. STANDARD bouquet is approx. 11H x 11W. DELUXE bouquet is approx. 12H x 12W. PREMIUM bouquet is approx. 13H x 13W. You save over $6 at FlowersFast! (Compare to FTD retail price: $45 + $22.98 for same-day delivery.) You get the same quality, at a lower price! No extra charge for same-day delivery. FREE personalized gift message included. (Extra delivery charge for Alaska and Hawaii) Same-day florist delivery is available for this item, for orders placed before Noon in the recipient's timezone. Please see the Ordering and Delivery Information.